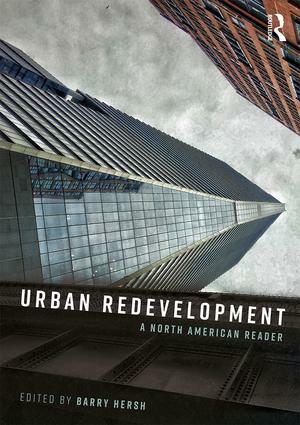 Urban redevelopment plays a major part in the growth strategy of the modern city, and the goal of this book is to examine the various aspects of redevelopment, its principles and practices in the North American context. Urban Redevelopment: A North American Reader seeks to shed light on the practice by looking at both its failures and successes, ideas that seemed to work in specific circumstances but not in others. The book aims to provide guidance to academics, practitioners and professionals on how, when, where and why, specific approaches worked and when they didn’t. While one has to deal with each case specifically, it is the interactions that are key. The contributors offer insight into how urban design affects behavior, how finance drives architectural choices, how social equity interacts with economic development, how demographical diversity drives cities’ growth, how politics determine land use decisions, how management deals with market choices, and how there are multiple influences and impacts of every decision. The book moves from the history of urban redevelopment, The City Beautiful movement, grand concourses and plazas, through urban renewal, superblocks and downtown pedestrian malls to today’s place-making: transit-oriented design, street quieting, new urbanism, publicly accessible, softer, waterfront design, funky small urban spaces and public-private megaprojects. This history also moves from grand masters such as Baron Haussmann and Robert Moses through community participation, to stakeholder involvement to creative local leadership. The increased importance of sustainability, high-energy performance, resilience and both pre- and post-catastrophe planning are also discussed in detail. Cities are acts of man, not nature; every street and building represents decisions made by people. Many of today’s best recognized urban theorists look for great forces; economic trends, technological shifts, political movements and try to analyze how they impact cities. One does not have to be a subscriber to the "great man" theory of history to see that in urban redevelopment, successful project champions use or sometimes overcome overall trends, using the tools and resources available to rebuild their community. This book is about how these projects are brought together, each somewhat differently, by the people who make them happen.